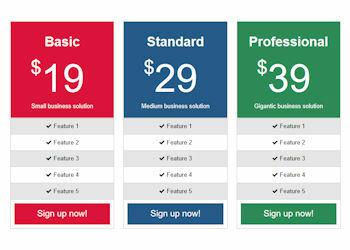 This extension helps you create attention-grabbing, responsive pricing tables. • Each ‘product’ can have a title, description, price, features and a button link to another (more details) page. • Set a different color for each product. • Responsive, price tables can be used in responsive layouts (with breakpoints) and layout grids. • A breakpoint can be specified to switch to ‘stacked’ mode for smaller screens. • 5 different layouts and many styling options.